Authentique and Taylored Expressions Project Inspiration Blog Hop! Hello! We have another special blog hop today, because Taylored Expressions has teamed up with Authentique! I don't know about you, but I LOVE Authentique's fabulous dp, so I was super excited to play along today:) The hop starts at the Authentique Blog HERE. If you've been hopping along, you should have arrived from Emily Lanham's amazing blog! For my card I used this gorgeous Taylored Expressions stamp set~Bonjour Couture with Coordinating Dies. We are featuring some of TE's awesome dies today, so I used a few different ones on my card. The frame was cut with the Label Stacklets 3 Dies, and the sentiment was stamped onto a Designer Mini Tags Die. For my borders, I used a new Ric Rac Borders Die and the Lace Chain Border Die. The tiny flowers were cut with a Flower Box Sprigs & Flowers Die. I used a mixture of gorgeous Authentique Grace and Authentique Strong on my card. I just love these beautiful colors! So how would you like to win a Taylored Expressions/Authentique Prize Pack??? All you have to do is hop along and leave comments on all of the blogs! There will be another blog hop tomorrow with more of the TE and Authentique DT members, so make sure you comment on those blogs too! You have until Monday, April 15th at midnight Pacific to hop. Taylor is also offering a blog hop special! All Taylored Dies are 10% off using code TENOFFDIES!!! The offer is good from April 11, 2013 until 11:59pm CST on April 19, 2013. Please note that the code is case sensitive and not available to wholesalers. Now it's time to hop on over to Angie Blom's fabulous blog, but don't forget to leave a comment before you go! Happy Hopping! fabulous project. thank you for sharing. Stunning design! Thank you for sharing. this is gorgeous....Love the colors and the stitching! Very pretty card! I love the colors! OMGoodness............. You had me at dress forms!! No I don't have an obsession or anything...ha!! I LoVe... Love...love this sooooo much!!! Gorgeous so perfect for this paper collection .. I guess I need this set now!! Haha! Love those dress forms! And you put them to excellent use! Love your card. The dress form is really cute. Beautiful card, perfectly executed. The dress forms are wonderful! Wow, you are show casing some must haves for my wish list! Thank you so much for crafting and sharing with us hoppers! Love the colors and layering. Beautiful card. I love all the textures, colors, and patterns! Great card! This card really reflects a love of crafting. The sewing element appeals to me. The colors are so nice! dress forms and tiny prints go together so well! I love to smock and like to use my fabrics on cards as though it were pattern paper. So i really relate to your card. Thanks for inspiration. Such a beautiful vintage card! I absolutely love the dress forms & that border is gorgeous! Beautiful! Love your choice of dies & overall design of your card is very nice. The lace border die is really fun. Thanks so much. Thanks for sharing love your card! 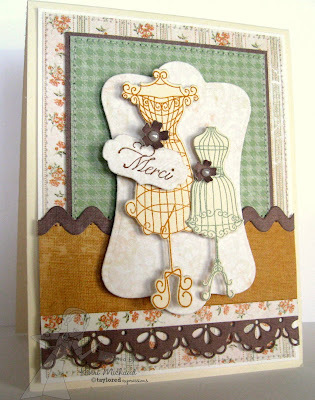 Hi Kerri...I love that lace border die you used...added just the right touch. The colors are beautiful together. Great job!!! There are so many gorgeous elements that you have chosen to make this amazing card. I love the soft floral paper, the ric rac border, and I love the machine stitching. Wonderful inspiration. Thank you. Perfectly paired papers and dies!!! BEAUTIFUL creation! I love the way the label stacklets 3 anchor the focal point. I love them all cut out so nicely. Gorgeous card! Just my style! Truly love this card. The zig zag and lacey looking papers are so pretty. They are great for this card. Love your card Kerri, those colors and prints in Grace and Strong work so well together. 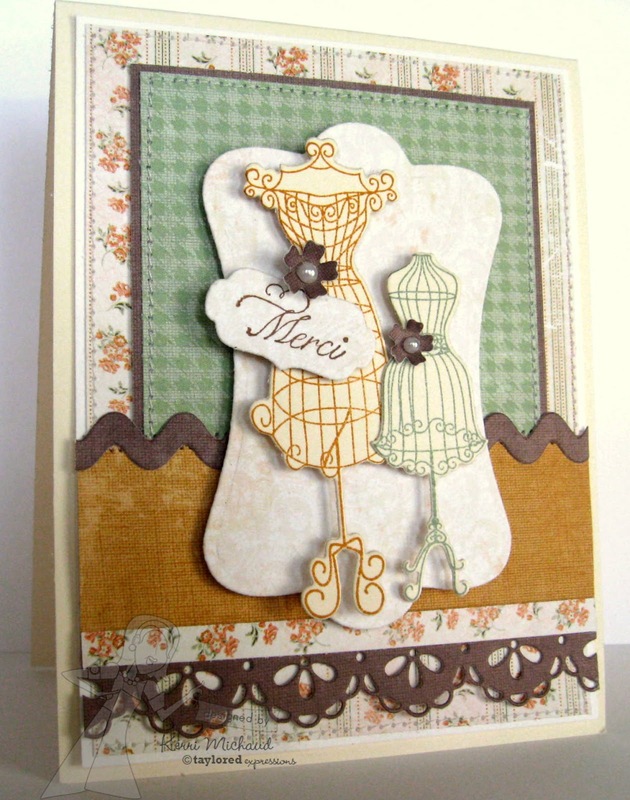 Lovin' the Bonjour Couture die and that Lace Chain die... simply beautiful! Adorable card! Has a bit of vintage flair. 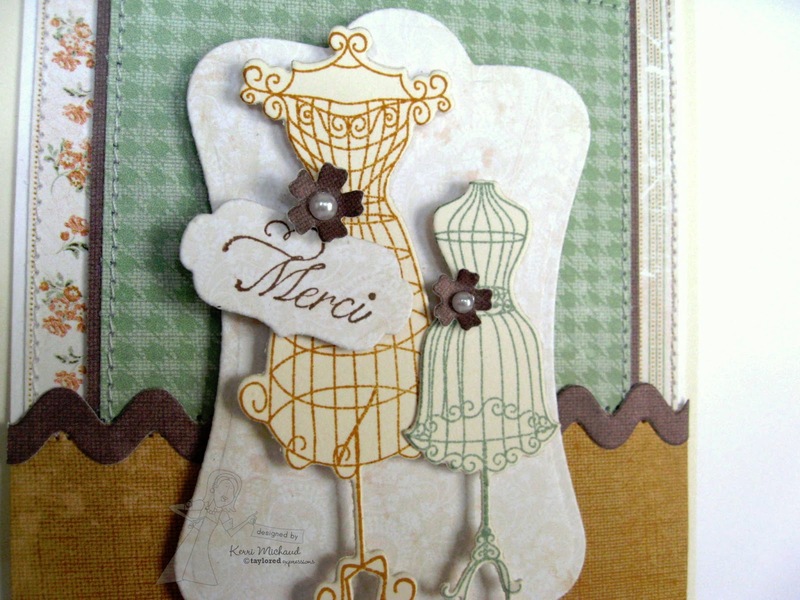 Merci - A beautiful card! Love your color choices and the layering. Very nice card. Don't you just love all the dies? Good-bye fussy cutting, hello wonderful, creative dies! Merci is right, love the dress forms. This is gorgeous!!! I love the dress forms and the colors! Lovely! Beautiful papers and I love your choice of colors! Lovely card! I really like the colors and patterns you used on this. GReat card, I like all the stitching and the layers! Gorgeous card! Love the pretty color combo! Fantastic dies and papers! Love the sweet paper you've chosen! It compliments the dress form die so well or is it the other way around!! (ha!) Either way it's a gorgeous card. Lovely, lovely! Thanks for sharing. Gorgeous card! I love your color combo. Beautiful, Kerri! Love these elegant dress forms side by side! Kerri ... I absolutely ADORE your work. First time visiting here for me but I'll be back. Promise. Love your work! So nicely laid out! I have seen so much with the dress frames and just not sure about them yet but cards like this are swaying me toward and impule buy! Love the paper patterns with the card too....dainty flowers and the heavier design....must be I spent too much time at Joann's today! Wonderful papers and dies you used on your card. :0 your card is gorgeous!!! Merci, Kerri for this wonderful card. Sure love the dress form stamps and does and these wonderful papers. What a lovely card. I love all your details. Wonderful job.